The Systems Model of Corruption and Anti-Corruption Reform starts from the premise that political will for anti-corruption reform does not depend solely on expectations of political capital, but that it rather involves considerations of both political capital and potential illegal benefits that become threatened. 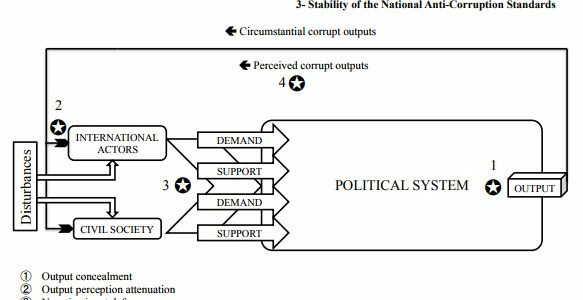 Following this argument, the model described four different ways in which underdeveloped national anti-corruption standards create stress for the domestic political system: First, by allowing corruption to continue, they create or exacerbate economic discontent. Second, they increase demands and decrease political support by allowing the incidence of corruption scandals. Third, they decrease support by ignoring international and domestic demands for anti-corruption reform. Fourth, they threaten the survival of both the government and the political regime when one or more of the previous scenarios are allowed to continue unchallenged for an extended period of time. From the identification of these theoretical scenarios, the model was finally able to suggest a variety of coping mechanisms available to national authorities to secure the stability of the status quo during episodes of stress. The inclusion of nuances found between developed and underdeveloped countries, specifically those regarding focal points of corruption (input vs. output stages) and the separation of public from private roles. The inclusion of nuances to distinguish between democratic and authoritarian regimes, following Bueno de Mesquita’s model of coalitions. The adoption of a leadership character typology to better account for, and explain, the role of agency in reform and counter-reform processes. The assessment of individual’s role following the model of corruption tolerance, popular mobilization (developed independently from this study), and public integrity (developed independently from this study). The provision of a basic structure to inform the application of System Dynamics, in order to build simulation models of general corruption.